LINCOLN, Neb. 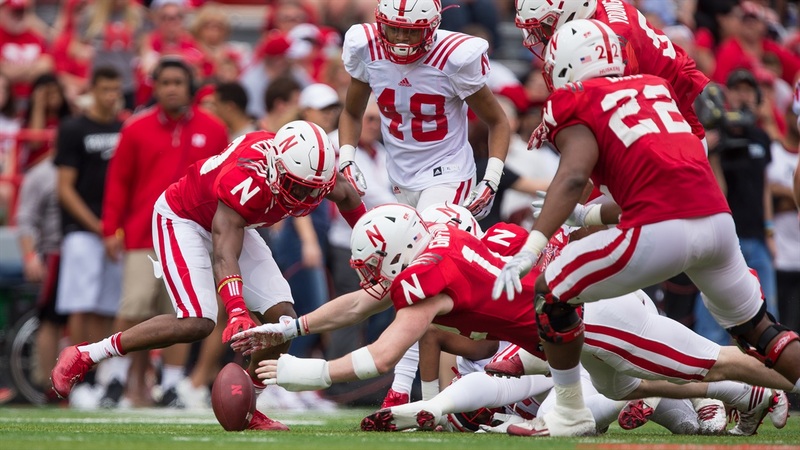 — Defensive coordinator Bob Diaco said after a recent practice that anyone who was planning to learn anything significant about the Nebraska defense from the spring game would be disappointed, and he was not kidding. The Huskers went about as vanilla on defense as possible in Saturday’s spring game, so much so that they did not even line up in the three-man front. Coach Mike Riley said that one can never be too careful with prying eyes around. The defense has seemed to hold the upper hand against the offense in practices throughout the spring, but Saturday’s game belonged to the offense for the most part with all four quarterbacks completing passes at a high rate and several skill position players making big plays. However, even so, there were a handful of stand-out players and plays on the defensive side of the ball. First and foremost of those was field-side outside linebacker Luke Gifford. The junior-to-be from Lincoln Southeast did not let his broken left hand slow him down on Saturday as he recorded two tackles and forced two turnovers. First, Gifford tackled freshman wide receiver Keyshawn Johnson Jr. after a reception and popped the ball free then recovered it on his own for the first turnover of the game. On the next drive, Gifford sniffed out a halfback screen and tackled Wyatt Mazour for a loss of two, then on the next play he intercepted an off-target throw by freshman quarterback Tristan Gebbia with his one good hand and ran it back 24 yards. Senior-to-be cornerback Chris Jones is one of if not the most experienced player on the defense, and he said the one area of his game he wants to improve most is his aggressiveness. Jones displayed that aggressiveness in the first half, beating his block on a screen and taking down tight end Brandon Hohenstein for no gain on third down. He played it perfectly to get his defense off the field and prevent the White squad from building up some early momentum. Sophomore-to-be nose tackle Khalil Davis had a big second half for the Red squad, opening it by bursting through the line of scrimmage to record a tackle for a loss of 1 on the first play. Later, he blasted through the line again to get to the quarterback and his brother Carlos followed right behind him to play clean-up as the two combined for one of only two “sacks” in the game (the officials blew the play dead as soon as quarterbacks were touched). Spring football might be over for those two, but they will not get any kind of break as they will report to track practice at Nebraska on Monday. Overall, the defense does need to continue to improve its tackling as several offensive players shook more than one would-be tackler (welcome to college football, Avery Roberts). But with the lack of specific assignments and advanced schemes, it is hard to draw too many conclusions from the defense as a whole. >> Redshirt freshman safety Marquel Dismuke dished out two of the hardest hits of the day and finished with six tackles overall, second to only Tony Butler on the White squad. Tight end Tyler Hoppes was slow to get up after the second of those two big hits. Butler also made a nice play of his own, getting isolated on slot receiver Keyan Williams and managing to get his hands on Williams and pull him down at the line despite a quality juke attempt by the receiver. >> Redshirt freshman linebacker Pernell Jefferson did not record any tackles, but he did break up two passes rushing off the end. Linebackers and defensive linemen getting their hands up and disrupting passes is something we saw more of as the spring rolled on. >> Aaron Williams had a brutal run stuff early on, flying in from the secondary to stone-wall the running back at the line of scrimmage. I think he feels comfortable playing safety full-time.